The IT industry is a progressively evolving sector. Companies have to constantly innovate to ensure their technologies are current and up to date. This requires continuous investment in training staff locally and more often abroad which can be extremely expensive. In addition, local industry players have often expressed concerns regarding graduates completing their degrees without the necessary employability skills required by Industry to innovate and solve complex local problems (challenges). Multinational vendor companies equally find it difficult to introduce their new technologies in the local market as there are no local skills to build upon. The companies have to invest heavily in bringing international consultants to implement their solutions or train their clients. It is for these reasons that Strathmore University- @iLabAfrica Research Centre, has developed the Challenge Based Learning Programme, to address the gaping need for a steady channel of certified local capacity, equipped with both technical and soft skills. 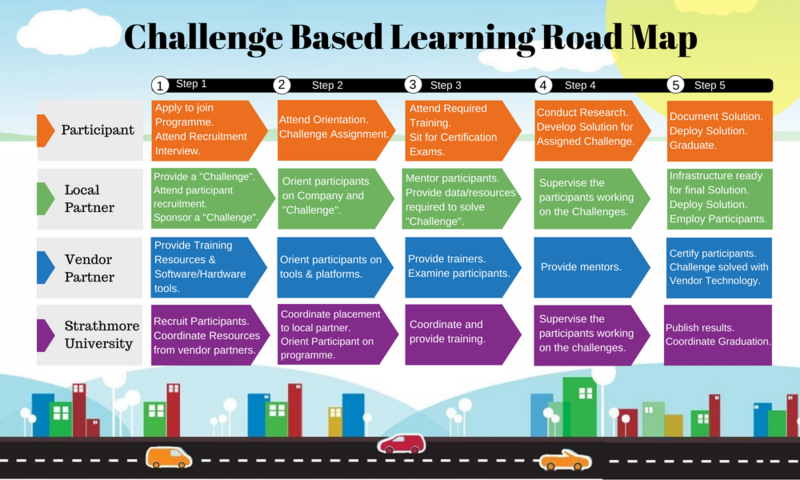 @iLabAfrica, a Research and Innovation Centre at Strathmore University, in collaboration with industry has developed the Challenge Based Learning Programme for graduate students and organization staff. The programme will train participants to solve non-trivial business problems “the challenge” for local companies using leading technologies provided by the international vendors. To create a sustainable pipeline of skills for local companies. To promote relevant technical training in new technologies that would fill the current skills gaps. To provide soft skills training to achieve an all rounded individual. To stimulate research and innovation. To provide a deep engagement between industry and academia. To focus on practically solving real life challenges in industry. To adopt a global outlook and provide world class talent while engaging top local and international industry experts. Recent University Graduates with a 1st or Upper 2nd Honours Degree in Information Technology, Engineering. IT professionals with experience in the workplace. Company trainees or current employees who fit the above criteria. The Programme takes a practical problem-solving approach. Theory classes will impart best industry practices and will be geared towards solving real-life problems. Participants will be placed in syndicate groups and assigned real-life challenges to solve. Groups will work under supervision of University mentors, sponsoring partner and international vendors to deliver viable solutions by the end of the Programme. Soft Skills and Design Thinking training. Identifying and defining the Big Idea (Challenge).
. Periodic seminars and workshops covering technical training provided by partners. Identifying solutions: Proposal of many viable solutions with prototyping, sketching and researching. Selection of one viable solution. Implementation and Evaluation: implement of the selected solution, measure outcomes, analysis and reviews. *Certificate of participation will be given to participants upon successful completion of the Programme. Participants will also receive certificates from partners who offer tool based training certificates. Programme participants are sponsored by corporate partners. However, participants will be required to pay a non-refundable commitment fee.